With Wimbledon in full swing - this was skiing on the longest day. Former British Olympic racer and Ski Sunday presenter Martin Bell skied on Monte Rosa in Italy's Aosta Valley. With a photographers and two guides he was dropped by helicopter at 6.15am at Punta Gnifetti, the temperature -25 degrees. 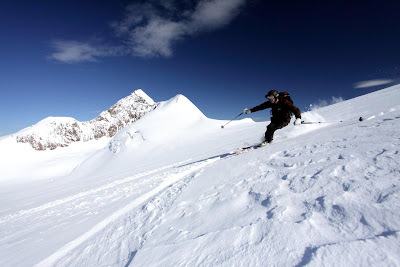 The skied over 1200 vertical feet towards the Col du Lys - more than you could manage in some resorts in mid-winter. "We were so lucky to get the most beautiful morning to take on this challenge", said Bell. "Bad weather at the weekend had laid down some fresh snow but strong winds had packed this down into tough, icy ridges. But the views made up for the poor snow. We were actually looking down on the Matterhorn to the north and to the south there was an almost sheer drop all the way down to Alagna - Gressoney's sister resort".